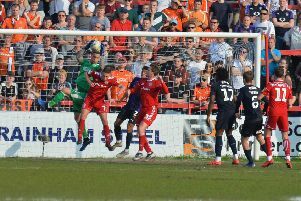 Luton Town equalled a club record going back some 80 years at the weekend when they kept their fourth successive league clean sheet on the road at Blackpool. After shutting out the Tangerines, it meant Luton have now gone 371 minutes since conceding on their travels in League Two with Exeter, Morecambe and Notts County also drawing blanks, as no home player has netted against Town since Leyton Orient’s Ollie Palmer in the 79th minute as Luton won 2-1 at the Matchroom Stadium on October 15, over two months ago now. Hatters have managed it twice in their history before, both times in the 1930s, as the 1935-36 Division Three South campaign saw Aldershot (1-0), Millwall (0-0), Notts County (3-0), Southend (1-0) fail to score past keeper Joe Coen. It was ended in unceremonious fashion though at Crystal Palace, with Luton were comprehensively thumped 5-1. Later that season, the Hatters refound their defensive solidity once more as the game after Joe Payne scored 10 in a 12-0 win over Bristol Rovers, Luton didn’t concede for the last three matches of the season at Newport (2-0), Coventry (0-0) and QPR (0-0), with Humphrey ‘Bill’ Dolman now between the posts. They then continued into the opening day of the 1936-37 season at Walsall (1-0), Dolman in goal again, before it was ended in Wales, with Cardiff City easing to a 3-0 triumph. Back to the current day and skipper Scott Cuthbert produced an inspirational display at Bloomfield Road as Luton made it four clean sheets, but boss Nathan Jones was quick to praise the entire back-line on the day. He said: “I wouldn’t single him out. I thought the three of them were outstanding. “Glen Rea is an animal, Johnny Mullins reads the game so well and is always in good positions. “Scotty is the central one so sometimes he’s able just to go to win it, but I wouldn’t single him out.